India is in first place for chickpeas production.Chickpeas are a source of zinc, folate and protein.Chickpeas are low in fat and most of this is polyunsaturated. India is in first place for chickpeas production.Chickpeas and Bengal grams are used to make curries and are one of the most popular vegetarian foods in India, Pakistan, Bangladesh and the UK.The plant grows to between 20–50 cm (8–20 inches) high and has small feathery leaves on either side of the stem.Because of their high protein content, chick peas are increasingly used as animal feed.One hundred grams of mature boiled chickpeas contains 164 calories, 2.6 grams of fat (of which only 0.27 grams is saturated), 7.6 grams of dietary fiber and 8.9 grams of protein. Desi, which has small, darker seeds and a rough coat, cultivated mostly in the India, Bangladesh, parts of Pakistan, Ethiopia, Mexico, and Iran. Kabuli, which has lighter coloured, larger seeds and a smoother coat, mainly grown in India, also introduced during the 18th century to India. 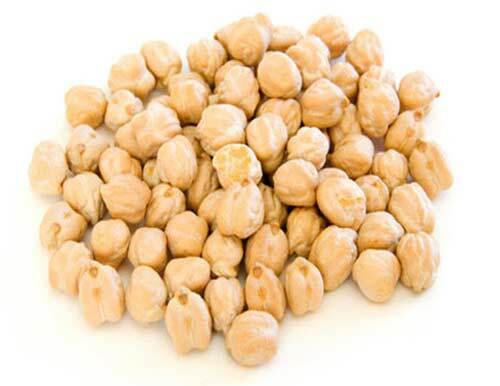 Our Kabuli chick peas has lighter colour, larger seeds and a smoother coating.